Here is my third Koeka knock-off project! 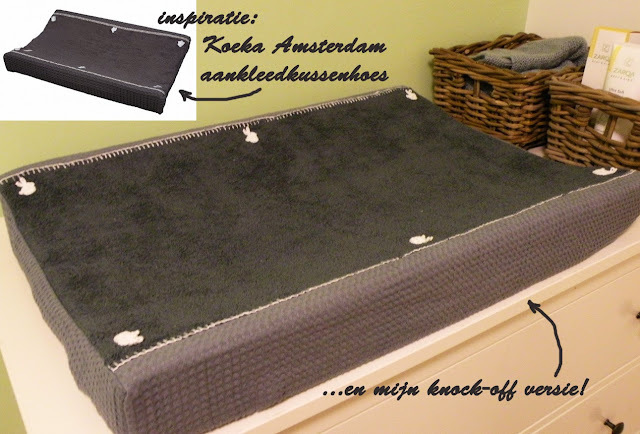 For the changing pad I used their 'Amsterdam' changing pad cover as inspiration. They use a cotton waffle fabric in combination with a cotton bath-towel fabric for the middle section. These sell for about 45 euro's a piece! ...with a way better fit at the sides and corners! My costs were for two changing pads less than 15 euro's! About 6 euro's for 85 cm of cotton waffle fabric, 3.99 euro's for one IKEA Haren bath towel (70x100cm), about 1 euro of elastics and 1 euro of embroidery thread. 1. Prewash and iron your fabrics before starting! It is better to let the fabric shrink before the first use instead of the second one... I prewas my cotton fabrics at a normal temperature, but then put them in the dryer with fairly hot air. Cotton waffle fabric tends to 'bobble' after washing. After prewashing I ironed my big piece of fabric and after cutting the rectangular pieces I ironed them again, making sure that the stripes run horizontally and vertically. Making the cover requires a bit of 3 dimensional thinking. You need to 'translate' a 3-dimensional shape into flat, 2d pieces. 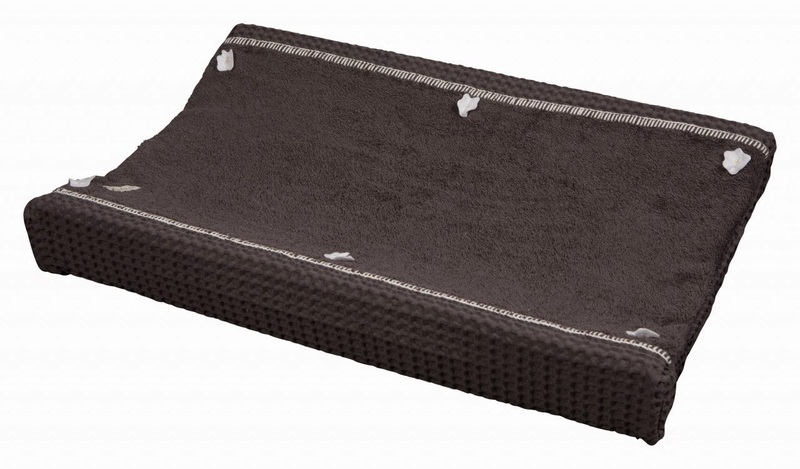 The cover is made out of one rectangular upper part (consisting of two pieces of waffle cotton with a piece of bath towel in between) and 2 contoured parts for the short sides. First, measure your changing pad. 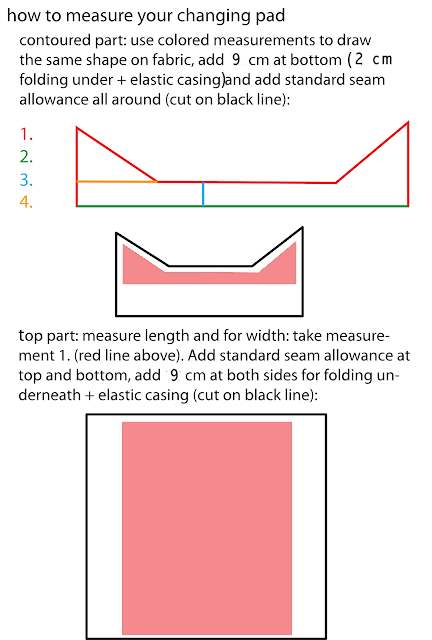 Use a standard seam allowance you are used to work with. For me it is 5/8" or 1,5 cm. I used my handy parallel tracing wheel to do this. You can either measure and draw directly on your fabric, or choose to make a paper pattern first. You can choose how wide you like to have the bath towel section. The original one goes up quite high at the sides. 4. Sew the waffle fabrics at the sides to fill up to the desired (measured) width according to pattern Pin and sew. 5. Finish seam allowance (I used a simple zigzag stitch) and fold the seams under the waffle cotton layer. Press. I used a really small top stitching on the waffle cotton to keep the seam allowances nicely in place. The topstitching will be practically invisible when you embroider next to it. Since it is easier to sew a straight line simply clip and open up the seam allowance (basically straighten the shaped part). Place the pieces with right sides together, pin and sew. Clip the other layer as well. As you can see my seams don't match up here. I decided to make the center part just a little bit shorter for a nice, tight fit. 9. Now it's time for a lot of relaxing handsewing! This is the best time to add the little appliques too. Of course, you are free to skip them or to use a Koeka-style applique. Those are made out of felt and secured with a simple cross-stitch (like an X) with embroidery thread. I didn't liked the flower appliques of the original cover, and made really simple and cute crochet bunnies instead. I used this tutorial. Make the elastic casing at the bottom. I used about 2 cm to do this, first folded back 0.5 cm and then 1.5 cm. Pinned and pressed before sewing. To prevent bulking the elastics only go around the corners: 10 cm at the short sides and 15 cm at the long sides, measured from the corner seam. The mid-sections remain straight for a better fit. I have made two covers, and planning to make a light grey one too. Just for fun!